Think you're a project cargo master? 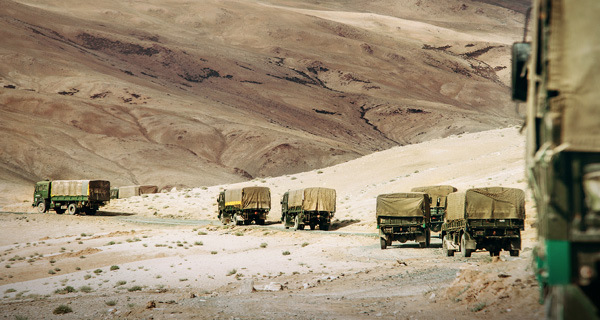 If you really want to be all you can be, try moving difficult cargo into an area with terrible infrastructure and hostile combatants, something military logisticians do every day. Everyone wants to be a POG, until there's POG stuff to be done. That's an old—but accurate—military joke. In the U.S. military, officers and enlisted personnel filling non-combat roles are jokingly referred to as POGs: Persons Other Than Grunts. Military logisticians—or loggies—may be POGs, but they face constant disruptions and supply chain threats. And these days, being a POG doesn't mean you won't see combat. Keeping installations and troops supplied, especially in hard-to-reach areas, takes intense training and no small amount of grit. The Wisconsin National Guard's 32nd Infantry Brigade Combat Team served extensively in the Operation Iraqi Freedom combat theater. They quickly became adept at moving hazardous shipments through potentially dangerous areas. Military vehicles have come a long way from the jeeps and cargo trucks we see in old episodes of M.A.S.H. The trucks that move freight across war zones can't just be functional, they must also be tactical. "Armored vehicle capabilities have continued to take huge strides," says Eric Sonahee, design and development engineer for Pailton Engineering, a provider of steering systems for armored military vehicles. "Fuel economy, suspension, and armor are just three examples of areas that have significantly taken off in recent years." Technological advances in vehicle manufacturing have contributed to safer, more efficient vehicles. For example, Pailton collaborated with tier one vehicle manufacturers to provide lightweight steering systems that enabled a top speed of 70 mph for some tactical vehicles. The weight of components and armor left older military vehicles with a top speed of 50 to 55 mph. In addition to performance, quality is also crucial. An equipment failure in a combat zone isn't just an inconvenience—it can mean life or death. Fortunately for our troops, we now live in a world of big data, and information gathered in the field and through tier one manufacturer testing can be used to design and build stronger, more reliable equipment. "With enough vehicle data from our customers, we are able to compile a block testing program on our test rigs that match the same loads and frequencies of the real-life conditions," Sonahee says. "This demonstrates the importance of collaboration, communication, and sharing data. "Success in the industry has been driven by the vital collaboration between tier one manufacturers and suppliers as part of the design and testing process," he adds. "We should celebrate this."